What is Percutaneous Nephrolithotomy (PCNL)? 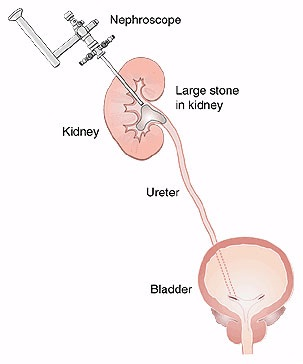 Percutaneous Nephrolithotomy (PCNL) is the preferred technique for treating large stones within the kidney. It involves keyhole surgery performed through a 1cm incision in the skin overlying the kidney (see diagram). Allows large or complicated stones to be treated in a minimally invasive fashion, where in the past this would have necessitated a large skin incision. Hospital stay is 3-4 days, and out of hospital recovery time is significantly shorter than traditional open surgery. Compared to traditional treatments of large complex stones, there are no disadvantages. Improved techniques and equipment have allowed this type of surgery to be safer than ever before. You will be required to have detailed imaging to allow the surgeon to assess the stone in fine detail regarding its relationship to the kidney and nearby structures. This will enable the surgeon to plan the best access point(s) to the kidney to allow effective clearance of stones. As the procedure is performed under general anaesthesia, you should have nothing to eat or drink for 6 hours prior to treatment. Regular medications can be taken with a sip of water with the exception of blood thinning agents (eg. warfarin, aspirin, clopidogrel) or non-steroidal anti-inflammatories which need to be stopped for 7-10 days. This form of surgery is low risk if performed by an urologist who is specifically trained in this technique, and aided by meticulous pre-operative planning. The specific risks are uncommon but include infection, excessive bleeding (necessitating blood transfusion 2%, embolisation 1%, renal exploration 0.5%), residual stones, and adjacent organ injury (spleen, liver, bowel, and lung). The operation is performed under a general anaesthetic and lasts approximately 1 to 3 hours. It is a team effort requiring coordination between surgeon, anaesthetist, radiology and nursing staff. You will be positioned on the operating room table lying on your front “stomach” for the duration of the surgery. The procedure is accomplished with the assistance of x-ray imaging to guide entry of a 1 cm tube into the kidney. This provides access into the kidney drainage system allowing telescopes and instruments to visualize, fragment and remove stones. A drainage catheter (nephrostomy tube) which exits through the skin is left in the kidney at the end of the procedure. You will have a temporary catheter called a nephrostomy tube draining the kidney, as well as a urinary catheter in-situ. They will be removed prior to discharge from hospital. The urine will be bloodstained for up to a week after discharge from hospital. Imaging is performed immediately after surgery to assess stone clearance. Occasionally, further minor surgery is required to clear any remaining stones to achieve complete stone clearance. Your hospital stay will be 3-4 days on average. You will be required to take it easy during the recovery phase for several weeks. There should only be minimal discomfort from the wound. Oral antibiotics will be given for a further five days to prevent infection. It is important to inform us if you feel unwell with fevers, chills, or develop heavy bleeding in the urine. Your initial follow-up will be in 6 weeks after discharge. Occasionally, a urinary stent is left to ensure the urine drains correctly into the bladder. This will require removal at a later time. Urinary Tract “Double J” Stent What is it? A thin, hollow tube placed inside the ureter during surgery to ensure drainage of urine from the kidney into the bladder. J shaped curls are present at both ends to hold the tube in place and prevent migration, hence the description “Double J stent”. It allows the kidney(s) to drain urine by temporarily relieving any blockage, or to assist the kidney(s) in draining stone fragments freely into the bladder if definitive kidney stone surgery is carried out. This tube has curls at either end which keeps the stent from moving. The lower curl can irritate the bladder and make you feel the need to go to the toilet all the time to empty your bladder. It can also cause moderate discomfort in the kidney region on urination, and at times you may notice blood in the urine. None of these symptoms are harmful and your body gets use to the stent over time. Simple analgesics may be helpful in controlling the discomfort . All the symptoms resolve after stent removal once definitive treatment is completed. Stents are used in temporary situations and must be removed from the body. Occasionally, some events occur where communication and follow up is lost and you must be aware that these stents should be removed within three (3) months from the date of insertion. In most cases they will be removed well before that time. It is important that you remember you have a stent and NOT FORGETabout it.